When Mason and I first met with Rod and Nancy in August 2014, we fell in love with 2nd Mile. 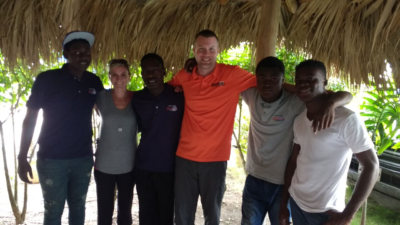 We were both SO moved by their passion to serve alongside the people of Bavaro and Monte Verde. It was inspiring to see how they were educating, equipping, and empowering them to lead sustainable lives. We knew we wanted to get involved somehow. Thankfully, for me, that meant letting Mason go and serve alongside Rod and Nancy while I cheered him on from the sidelines. And so I did. After all, Mason’s always had a heart for the Caribbean. I was happy to sit back and watch him step outside of his comfort zone to serve in another part of the world. But, by his third trip in 2016, I was DONE. I loved 2nd Mile, and I loved Mason’s heart for it, but I felt like I was losing him. At the time, I had just finished my Master’s degree, and I was in the middle of a major job transition at Notre Dame. My world was moving faster than I could keep up. I was overwhelmed. Everything in me wanted to stop him from going on this third trip; convince him that we needed to go back to life before 2nd Mile. Except I couldn’t. We couldn’t. Mason had developed strong, cross-cultural relationships with these people! They were like family to him, so I had to let him go. While he was gone, I spent a lot of time praying and reflecting. I began to recognize that I wasn’t losing him, my selfishness was pushing him away. So, as much as it scared me, I knew the only way forward was to follow him to the Dominican Republic. And so I did. I traveled to the Dominican Republic for the first time in January 2017. I was anxious, but excited to meet our sponsored child, Robinson, his family, and the 2nd Mile kids Mason had grown to love as his own. I only wrote one small journal entry on that first trip, but it captures the heart of what I’ve learned about God through this experience. Too much on my heart. Not much I can write, or even try to explain. In the Dominican Republic, people worship without care or concern for anything around them. They truly worship and the Holy Spirit is evident. It draws you in. In the Dominican Republic, kids are kids at EVERY age. I played with a toddler boy, just like I play with Westie and Lincoln (my nephews). I listened to Cale, Widlen, Christopher, and Roger laugh and goof around, just like the teenage boys at home. In the Dominican Republic, I can’t even bring myself to write or take pictures. I just want to be fully present so I can experience God’s handiwork in this beautiful place. God became SO real to me through that experience. Since then, I’ve continued to see that God is moving in ways we can’t begin to imagine. It’s overwhelming! But, if you look closely, you’ll see glimpses of the beauty that exists in EVERYTHING. That trip opened my eyes to the beauty that exists in the midst of darkness. It transformed the position of my heart. It marked a pivotal moment that changed the course of my faith journey. God called me to step outside of my comfort zone. And so I did. Without a doubt, God called Rod and Nancy Wildman into full time ministry in 2nd Mile Missions. Every day God calls people to participate in the ministry to the people of the Dominican Republic that we serve. Whether individuals go on a mission trip, collect and organize donations, or serve on the mission board, God has chosen each person to fulfill His purposes in the ministry. Copyright © 2019, 2nd Mile Missions, All Rights Reserved.